2008 Acura MDX Technology White 15/20 City/Highway MPG Parchment Leather. Odometer is 13304 miles below market average! Reviews: * The perfectly practical MDX is also the most powerful, most tech-savvy V6 SUV on the road, giving it assured access to the top tier of any premium midsize SUV shopping list. Source: KBB.com Awards: * 2008 KBB.com Best Resale Value Awards For more information, visit www.kbb.com. Kelley Blue Book is a registered trademark of Kelley Blue Book Co., Inc. KBB Fair Market Range Low: $8,691 KBB Fair Market Range High: $10,838 Celebrating 30 Years as Ohio's First Acura Dealer! 614-761-1222 Proudly Serving: Dublin, Columbus, Westerville, Chillicothe, Dayton, Xenia, Springfield, Wilmington, Beavercreek, Marysville, Cincinnati, Cleveland, Lancaster, West Jefferson, Grove City, and all of greater Ohio. 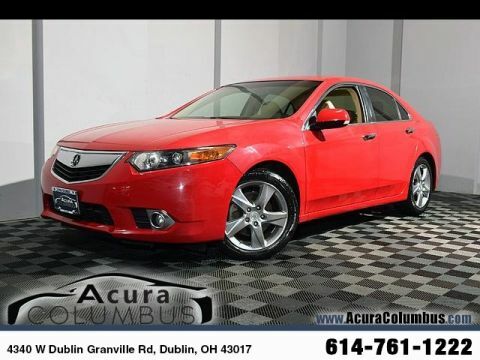 2013 Acura TSX 2.4 Technology Milano Red 22/31 City/Highway MPG Odometer is 30242 miles below market average! 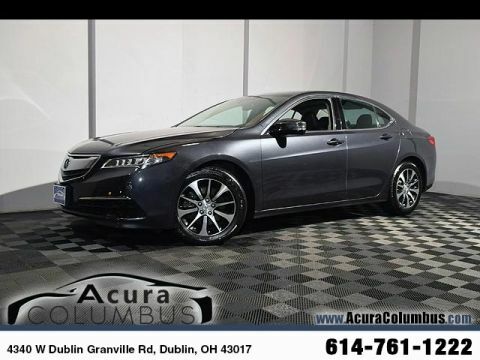 22/31 City/Highway MPG Reviews: * If you are looking for a well-appointed premium luxury vehicle that delivers ample fuel economy, a simple pricing structure and an envious reliability record, the 2013 Acura TSX certainly qualifies. Source: KBB.com * Impressive number of standard and technology features; spacious interior; sporty handling with V6 sedan and wagon; excellent build and materials quality. Source: Edmunds * Generous number of standard features; above-average fuel economy from Hybrid model. Source: Edmunds Awards: * 2013 IIHS Top Safety Pick *Insurance Institute for Highway Safety. 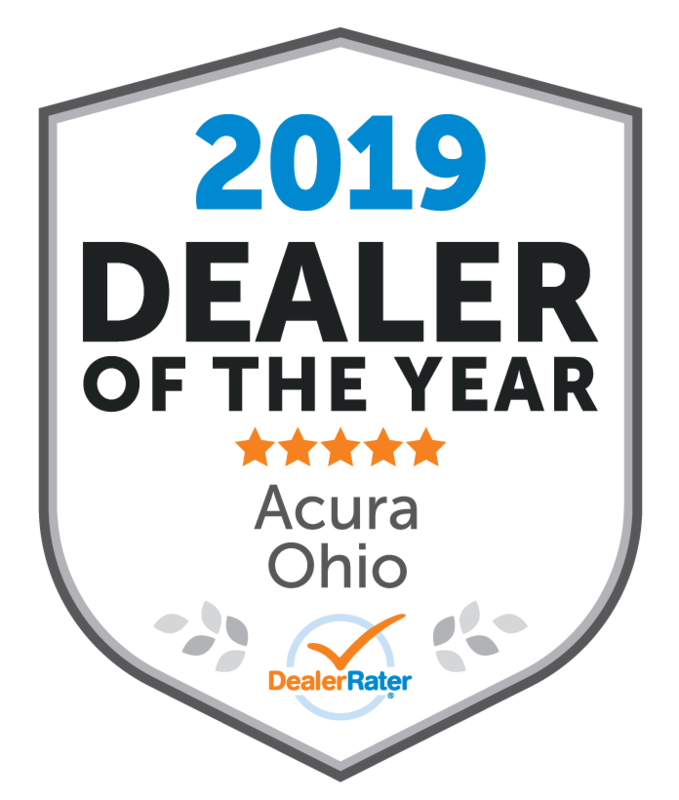 KBB Fair Market Range Low: $14,893 KBB Fair Market Range High: $16,844 Celebrating 30 Years as Ohio's First Acura Dealer! 614-761-1222 Proudly Serving: Dublin, Columbus, Westerville, Chillicothe, Dayton, Xenia, Springfield, Wilmington, Beavercreek, Marysville, Cincinnati, Cleveland, Lancaster, West Jefferson, Grove City, and all of greater Ohio. 2012 Acura MDX Technology Black 16/21 City/Highway MPG Parchment Leather. Odometer is 626 miles below market average! Reviews: * Power, performance and usability make the 2012 Acura MDX an unusually capable premium midsize SUV. It also features a generous helping of clever, advanced technology. Source: KBB.com * Capable handling; user-friendly high-tech features; finely crafted interior; relatively roomy third-row seat. Source: Edmunds Awards: * 2012 IIHS Top Safety Pick *Insurance Institute for Highway Safety. KBB Fair Market Range Low: $14,922 KBB Fair Market Range High: $17,227 Celebrating 30 Years as Ohio's First Acura Dealer! 614-761-1222 Proudly Serving: Dublin, Columbus, Westerville, Chillicothe, Dayton, Xenia, Springfield, Wilmington, Beavercreek, Marysville, Cincinnati, Cleveland, Lancaster, West Jefferson, Grove City, and all of greater Ohio. 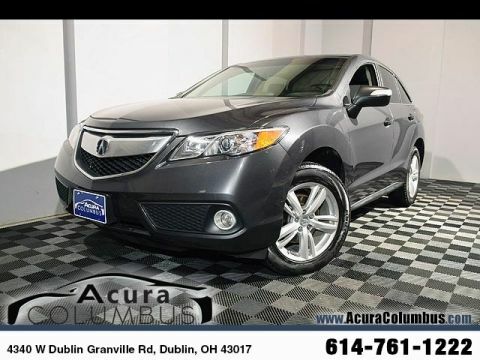 2015 Acura RDX Technology Package Gray 19/27 City/Highway MPG AWD. 19/27 City/Highway MPG Reviews: * The 2015 RDX is the ideal choice if you want a luxury SUV but not the sticker shock and questionable reliability that can be associated with one. Above-average resale value and Acura's reputation for quality add further peace of mind. Source: KBB.com * Strong yet fuel-efficient V6; generous rear legroom; lengthy standard features list; competitive price. Source: Edmunds * The 2015 Acura RDX is a powerful compact crossover that offers a stylish exterior with a luxury interior. The RDX is equipped with a 3.5-liter, i-VTEC V-6 Engine, that produces 273 Horsepower. Despite its power it remains fuel efficient with the front-wheel drive model getting an EPA rating of 20 MPG City, 28 MPG Highway, and a combined 23 MPG. The all-wheel drive version is impressive as well with 19 MPG City, 27 MPG Highway, and 22 MPG combined. The Engine in the RDX comes with Variable Cylinder Management that automatically makes changes to the number of cylinders used at any given time. It enables it so the engine can run on six, four, or three cylinders depending on power demand, allowing for the most fuel efficiency possible. The RDX comes standard with a Sequential SportShift Automatic Transmission with steering-mounted paddle shifters. You have the option to choose either Drive mode for smooth shifting and optimal fuel efficiency, or you can go into Sport mode for performance driving and quick, precise shifts at your fingertips. If you choose to upgrade into the All-Wheel Drive model, it comes with Intelligent Control. This uses the front wheels only to propel the vehicle during regular cruising, and supplies more power to the rear depending on how slippery the surface you are driving on is. The interior of the RDX offers comfortable seating for up to five passengers with its plush leather seats in front and back. The driver and front passenger get dual-level heaters in seats and dual-zone climate controls. The driver's seat also comes equipped with a lumbar adjustment feature to keep your back comfortable. For safety, the RDX comes with a rearview camera, which activates whenever the vehicle is put into reverse. Also included is the Bluetooth HandsFreeLink, as well as the text message function that can read your texts to you and supply you with your choice of six pre-loaded responses. The Technology Package includes a Navigation System and a Destination Database to direct you to nearby ATMs, restaurants, and more. It also comes with AcuraLink, an easy to use data network that reminds you about maintenance appointments and communicates directly with your dealer. If you are looking for comfort without compromise, step into the 2015 Acura RDX. Source: The Manufacturer Summary Awards: * 2015 KBB.com 10 Best Luxury Cars Under $35,000 For more information, visit www.kbb.com. Kelley Blue Book is a registered trademark of Kelley Blue Book Co., Inc. KBB Fair Market Range Low: $16,634 KBB Fair Market Range High: $18,985 Celebrating 30 Years as Ohio's First Acura Dealer! 614-761-1222 Proudly Serving: Dublin, Columbus, Westerville, Chillicothe, Dayton, Xenia, Springfield, Wilmington, Beavercreek, Marysville, Cincinnati, Cleveland, Lancaster, West Jefferson, Grove City, and all of greater Ohio. 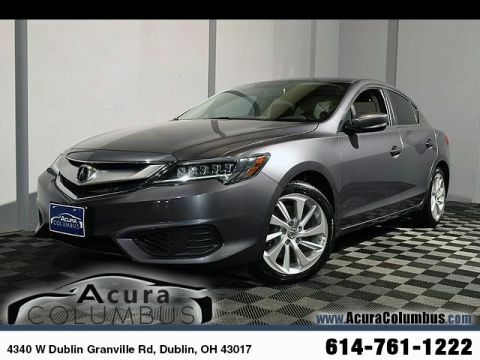 2017 Acura ILX Modern Steel Metallic 25/35 City/Highway MPG Odometer is 2663 miles below market average! 25/35 City/Highway MPG Reviews: * Competitive pricing for a car with its level of equipment; precise steering lends a sense of sportiness; excellent crash test scores. Source: Edmunds Awards: * 2017 IIHS Top Safety Pick (When equipped with optional front crash protection) * 2017 KBB.com 5-Year Cost to Own Awards 2016 Kelley Blue Book Brand Image Awards are based on the Brand Watch(tm) study from Kelley Blue Book Market Intelligence. Award calculated among non-luxury shoppers. For more information, visit www.kbb.com. Kelley Blue Book is a registered trademark of Kelley Blue Book Co., Inc. *Insurance Institute for Highway Safety. KBB Fair Market Range Low: $17,866 KBB Fair Market Range High: $20,971 Celebrating 30 Years as Ohio's First Acura Dealer! 614-761-1222 Proudly Serving: Dublin, Columbus, Westerville, Chillicothe, Dayton, Xenia, Springfield, Wilmington, Beavercreek, Marysville, Cincinnati, Cleveland, Lancaster, West Jefferson, Grove City, and all of greater Ohio. 2016 Acura TLX 2.4L Gray 24/35 City/Highway MPG Certified. Acura Certified Pre-Owned Details: * Limited Warranty: 12 Month/12,000 Mile (whichever comes first) after new car warranty expires or from certified purchase date * Transferable Warranty * Warranty Deductible: $0 * Powertrain Limited Warranty: 84 Month/100,000 Mile (whichever comes first) from original in-service date * Vehicle History * 182 Point Inspection * Roadside Assistance * Includes Trip Interruption and Concierge Services 24/35 City/Highway MPG Reviews: * Cabin does a good job of filtering out unwanted noise; rear seat offers more legroom than many competitors; loads of features for the money. Source: Edmunds Awards: * ALG Residual Value Awards * 2016 KBB.com 10 Best Luxury Cars Under $35,000 * 2016 KBB.com 5-Year Cost to Own Awards 2016 Kelley Blue Book Brand Image Awards are based on the Brand Watch(tm) study from Kelley Blue Book Market Intelligence. Award calculated among non-luxury shoppers. For more information, visit www.kbb.com. Kelley Blue Book is a registered trademark of Kelley Blue Book Co., Inc. KBB Fair Market Range Low: $17,061 KBB Fair Market Range High: $20,482 Celebrating 30 Years as Ohio's First Acura Dealer! 614-761-1222 Proudly Serving: Dublin, Columbus, Westerville, Chillicothe, Dayton, Xenia, Springfield, Wilmington, Beavercreek, Marysville, Cincinnati, Cleveland, Lancaster, West Jefferson, Grove City, and all of greater Ohio. 2016 Acura TLX 2.4L Graphite Luster Metallic 24/35 City/Highway MPG 24/35 City/Highway MPG Reviews: * Cabin does a good job of filtering out unwanted noise; rear seat offers more legroom than many competitors; loads of features for the money. Source: Edmunds Awards: * ALG Residual Value Awards * 2016 KBB.com 10 Best Luxury Cars Under $35,000 * 2016 KBB.com 5-Year Cost to Own Awards 2016 Kelley Blue Book Brand Image Awards are based on the Brand Watch(tm) study from Kelley Blue Book Market Intelligence. Award calculated among non-luxury shoppers. For more information, visit www.kbb.com. Kelley Blue Book is a registered trademark of Kelley Blue Book Co., Inc. KBB Fair Market Range Low: $17,287 KBB Fair Market Range High: $20,708 Celebrating 30 Years as Ohio's First Acura Dealer! 614-761-1222 Proudly Serving: Dublin, Columbus, Westerville, Chillicothe, Dayton, Xenia, Springfield, Wilmington, Beavercreek, Marysville, Cincinnati, Cleveland, Lancaster, West Jefferson, Grove City, and all of greater Ohio. 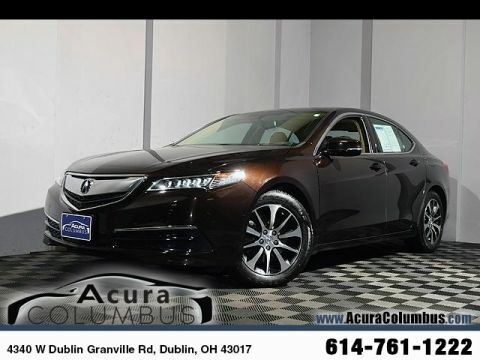 2016 Acura TLX 2.4L Black Copper Pearl 24/35 City/Highway MPG 24/35 City/Highway MPG Reviews: * Cabin does a good job of filtering out unwanted noise; rear seat offers more legroom than many competitors; loads of features for the money. Source: Edmunds Awards: * ALG Residual Value Awards * 2016 KBB.com 10 Best Luxury Cars Under $35,000 * 2016 KBB.com 5-Year Cost to Own Awards 2016 Kelley Blue Book Brand Image Awards are based on the Brand Watch(tm) study from Kelley Blue Book Market Intelligence. Award calculated among non-luxury shoppers. For more information, visit www.kbb.com. Kelley Blue Book is a registered trademark of Kelley Blue Book Co., Inc. KBB Fair Market Range Low: $17,537 KBB Fair Market Range High: $21,784 Celebrating 30 Years as Ohio's First Acura Dealer! 614-761-1222 Proudly Serving: Dublin, Columbus, Westerville, Chillicothe, Dayton, Xenia, Springfield, Wilmington, Beavercreek, Marysville, Cincinnati, Cleveland, Lancaster, West Jefferson, Grove City, and all of greater Ohio. 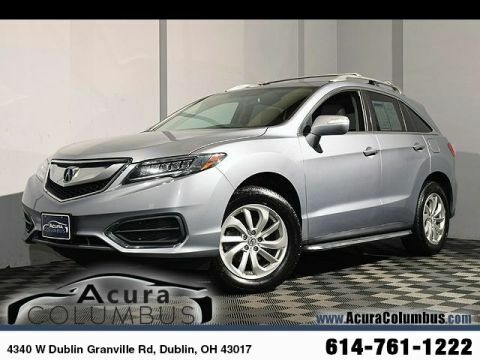 2016 Acura RDX AWD w/Technology Package Silver 19/28 City/Highway MPG AWD. 19/28 City/Highway MPG Reviews: * Strong acceleration and fuel economy from standard V6 engine; high-mounted rear seat provides generous legroom and a commanding view; more standard features than most competitors; price; generous cargo capacity for the segment. Source: Edmunds Awards: * 2016 KBB.com 10 Best Luxury Cars Under $35,000 * 2016 KBB.com 5-Year Cost to Own Awards 2016 Kelley Blue Book Brand Image Awards are based on the Brand Watch(tm) study from Kelley Blue Book Market Intelligence. Award calculated among non-luxury shoppers. For more information, visit www.kbb.com. Kelley Blue Book is a registered trademark of Kelley Blue Book Co., Inc. KBB Fair Market Range Low: $17,542 KBB Fair Market Range High: $20,145 Celebrating 30 Years as Ohio's First Acura Dealer! 614-761-1222 Proudly Serving: Dublin, Columbus, Westerville, Chillicothe, Dayton, Xenia, Springfield, Wilmington, Beavercreek, Marysville, Cincinnati, Cleveland, Lancaster, West Jefferson, Grove City, and all of greater Ohio. 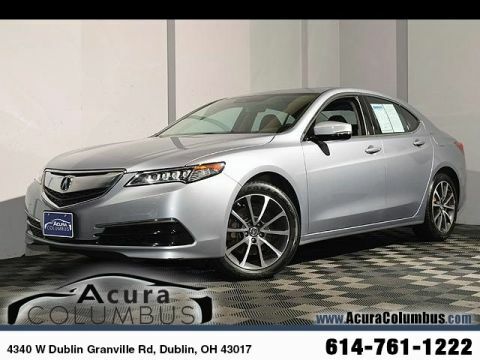 2016 Acura TLX 2.4L w/Technology Package Silver 24/35 City/Highway MPG 24/35 City/Highway MPG Reviews: * Cabin does a good job of filtering out unwanted noise; rear seat offers more legroom than many competitors; loads of features for the money. Source: Edmunds Awards: * ALG Residual Value Awards * 2016 KBB.com 10 Best Luxury Cars Under $35,000 * 2016 KBB.com 5-Year Cost to Own Awards 2016 Kelley Blue Book Brand Image Awards are based on the Brand Watch(tm) study from Kelley Blue Book Market Intelligence. Award calculated among non-luxury shoppers. For more information, visit www.kbb.com. Kelley Blue Book is a registered trademark of Kelley Blue Book Co., Inc. KBB Fair Market Range Low: $19,217 KBB Fair Market Range High: $22,638 Celebrating 30 Years as Ohio's First Acura Dealer! 614-761-1222 Proudly Serving: Dublin, Columbus, Westerville, Chillicothe, Dayton, Xenia, Springfield, Wilmington, Beavercreek, Marysville, Cincinnati, Cleveland, Lancaster, West Jefferson, Grove City, and all of greater Ohio. 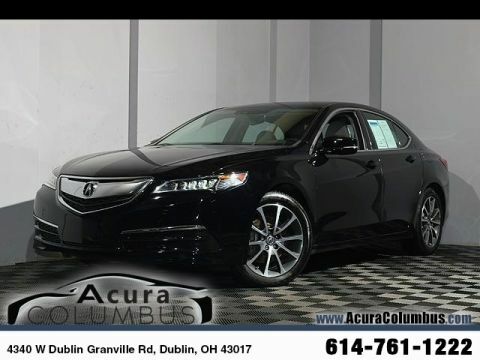 2016 Acura TLX 2.4L w/Technology Package Black 24/35 City/Highway MPG Odometer is 7304 miles below market average! 24/35 City/Highway MPG Reviews: * Cabin does a good job of filtering out unwanted noise; rear seat offers more legroom than many competitors; loads of features for the money. Source: Edmunds Awards: * ALG Residual Value Awards * 2016 KBB.com 10 Best Luxury Cars Under $35,000 * 2016 KBB.com 5-Year Cost to Own Awards 2016 Kelley Blue Book Brand Image Awards are based on the Brand Watch(tm) study from Kelley Blue Book Market Intelligence. Award calculated among non-luxury shoppers. For more information, visit www.kbb.com. Kelley Blue Book is a registered trademark of Kelley Blue Book Co., Inc. KBB Fair Market Range Low: $18,959 KBB Fair Market Range High: $22,380 Celebrating 30 Years as Ohio's First Acura Dealer! 614-761-1222 Proudly Serving: Dublin, Columbus, Westerville, Chillicothe, Dayton, Xenia, Springfield, Wilmington, Beavercreek, Marysville, Cincinnati, Cleveland, Lancaster, West Jefferson, Grove City, and all of greater Ohio. 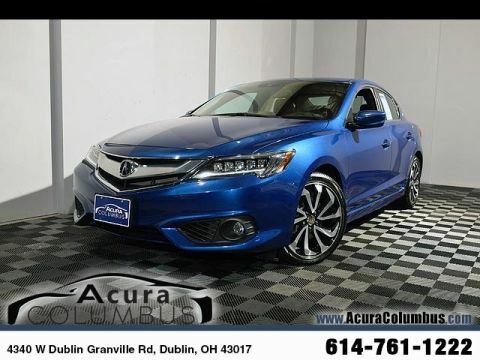 2017 Acura ILX Premium and A-SPEC Packages Blue 25/35 City/Highway MPG Certified. Acura Certified Pre-Owned Details: * Transferable Warranty * Roadside Assistance * Limited Warranty: 12 Month/12,000 Mile (whichever comes first) after new car warranty expires or from certified purchase date * Powertrain Limited Warranty: 84 Month/100,000 Mile (whichever comes first) from original in-service date * 182 Point Inspection * Warranty Deductible: $0 * Includes Trip Interruption and Concierge Services * Vehicle History 25/35 City/Highway MPG Reviews: * Competitive pricing for a car with its level of equipment; precise steering lends a sense of sportiness; excellent crash test scores. Source: Edmunds Awards: * 2017 IIHS Top Safety Pick (When equipped with optional front crash protection) * 2017 KBB.com 5-Year Cost to Own Awards 2016 Kelley Blue Book Brand Image Awards are based on the Brand Watch(tm) study from Kelley Blue Book Market Intelligence. Award calculated among non-luxury shoppers. For more information, visit www.kbb.com. Kelley Blue Book is a registered trademark of Kelley Blue Book Co., Inc. *Insurance Institute for Highway Safety. KBB Fair Market Range Low: $17,945 KBB Fair Market Range High: $21,050 Celebrating 30 Years as Ohio's First Acura Dealer! 614-761-1222 Proudly Serving: Dublin, Columbus, Westerville, Chillicothe, Dayton, Xenia, Springfield, Wilmington, Beavercreek, Marysville, Cincinnati, Cleveland, Lancaster, West Jefferson, Grove City, and all of greater Ohio. 2016 Acura TLX 3.5L V6 w/Technology Package Black Copper Pearl 21/34 City/Highway MPG Certified. Acura Certified Pre-Owned Details: * Warranty Deductible: $0 * Powertrain Limited Warranty: 84 Month/100,000 Mile (whichever comes first) from original in-service date * Transferable Warranty * Includes Trip Interruption and Concierge Services * Vehicle History * Limited Warranty: 12 Month/12,000 Mile (whichever comes first) after new car warranty expires or from certified purchase date * 182 Point Inspection * Roadside Assistance Odometer is 7486 miles below market average! 21/34 City/Highway MPG Reviews: * Cabin does a good job of filtering out unwanted noise; rear seat offers more legroom than many competitors; loads of features for the money. Source: Edmunds Awards: * ALG Residual Value Awards * 2016 KBB.com 10 Best Luxury Cars Under $35,000 * 2016 KBB.com 5-Year Cost to Own Awards 2016 Kelley Blue Book Brand Image Awards are based on the Brand Watch(tm) study from Kelley Blue Book Market Intelligence. Award calculated among non-luxury shoppers. For more information, visit www.kbb.com. Kelley Blue Book is a registered trademark of Kelley Blue Book Co., Inc. KBB Fair Market Range Low: $21,383 KBB Fair Market Range High: $25,140 Celebrating 30 Years as Ohio's First Acura Dealer! 614-761-1222 Proudly Serving: Dublin, Columbus, Westerville, Chillicothe, Dayton, Xenia, Springfield, Wilmington, Beavercreek, Marysville, Cincinnati, Cleveland, Lancaster, West Jefferson, Grove City, and all of greater Ohio. 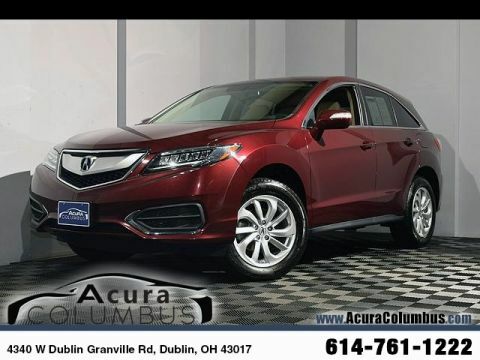 2016 Acura RDX Red 20/29 City/Highway MPG Odometer is 1075 miles below market average! 20/29 City/Highway MPG Reviews: * Strong acceleration and fuel economy from standard V6 engine; high-mounted rear seat provides generous legroom and a commanding view; more standard features than most competitors; price; generous cargo capacity for the segment. Source: Edmunds Awards: * 2016 KBB.com 10 Best Luxury Cars Under $35,000 * 2016 KBB.com 5-Year Cost to Own Awards 2016 Kelley Blue Book Brand Image Awards are based on the Brand Watch(tm) study from Kelley Blue Book Market Intelligence. Award calculated among non-luxury shoppers. For more information, visit www.kbb.com. Kelley Blue Book is a registered trademark of Kelley Blue Book Co., Inc. KBB Fair Market Range Low: $23,105 KBB Fair Market Range High: $25,712 Celebrating 30 Years as Ohio's First Acura Dealer! 614-761-1222 Proudly Serving: Dublin, Columbus, Westerville, Chillicothe, Dayton, Xenia, Springfield, Wilmington, Beavercreek, Marysville, Cincinnati, Cleveland, Lancaster, West Jefferson, Grove City, and all of greater Ohio. 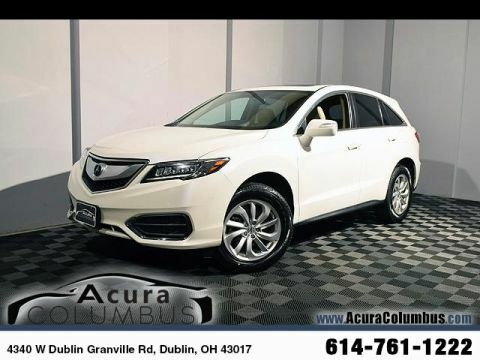 2016 Acura RDX SH-AWD White 19/28 City/Highway MPG AWD. Odometer is 532 miles below market average! 19/28 City/Highway MPG Reviews: * Strong acceleration and fuel economy from standard V6 engine; high-mounted rear seat provides generous legroom and a commanding view; more standard features than most competitors; price; generous cargo capacity for the segment. Source: Edmunds Awards: * 2016 KBB.com 10 Best Luxury Cars Under $35,000 * 2016 KBB.com 5-Year Cost to Own Awards 2016 Kelley Blue Book Brand Image Awards are based on the Brand Watch(tm) study from Kelley Blue Book Market Intelligence. Award calculated among non-luxury shoppers. For more information, visit www.kbb.com. Kelley Blue Book is a registered trademark of Kelley Blue Book Co., Inc. KBB Fair Market Range Low: $24,231 KBB Fair Market Range High: $26,838 Celebrating 30 Years as Ohio's First Acura Dealer! 614-761-1222 Proudly Serving: Dublin, Columbus, Westerville, Chillicothe, Dayton, Xenia, Springfield, Wilmington, Beavercreek, Marysville, Cincinnati, Cleveland, Lancaster, West Jefferson, Grove City, and all of greater Ohio. 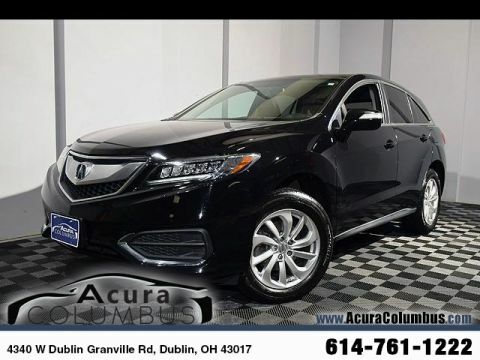 2016 Acura RDX SH-AWD Black 19/28 City/Highway MPG Certified. Acura Certified Pre-Owned Details: * Roadside Assistance * 182 Point Inspection * Limited Warranty: 12 Month/12,000 Mile (whichever comes first) after new car warranty expires or from certified purchase date * Powertrain Limited Warranty: 84 Month/100,000 Mile (whichever comes first) from original in-service date * Vehicle History * Warranty Deductible: $0 * Transferable Warranty * Includes Trip Interruption and Concierge Services AWD. Odometer is 650 miles below market average! 19/28 City/Highway MPG Reviews: * Strong acceleration and fuel economy from standard V6 engine; high-mounted rear seat provides generous legroom and a commanding view; more standard features than most competitors; price; generous cargo capacity for the segment. Source: Edmunds Awards: * 2016 KBB.com 10 Best Luxury Cars Under $35,000 * 2016 KBB.com 5-Year Cost to Own Awards 2016 Kelley Blue Book Brand Image Awards are based on the Brand Watch(tm) study from Kelley Blue Book Market Intelligence. Award calculated among non-luxury shoppers. For more information, visit www.kbb.com. Kelley Blue Book is a registered trademark of Kelley Blue Book Co., Inc. KBB Fair Market Range Low: $23,831 KBB Fair Market Range High: $26,434 Celebrating 30 Years as Ohio's First Acura Dealer! 614-761-1222 Proudly Serving: Dublin, Columbus, Westerville, Chillicothe, Dayton, Xenia, Springfield, Wilmington, Beavercreek, Marysville, Cincinnati, Cleveland, Lancaster, West Jefferson, Grove City, and all of greater Ohio. 2016 Acura TLX 3.5L V6 SH-AWD w/Advance Package Gray 21/31 City/Highway MPG Certified. Acura Certified Pre-Owned Details: * Transferable Warranty * Powertrain Limited Warranty: 84 Month/100,000 Mile (whichever comes first) from original in-service date * 182 Point Inspection * Warranty Deductible: $0 * Limited Warranty: 12 Month/12,000 Mile (whichever comes first) after new car warranty expires or from certified purchase date * Vehicle History * Includes Trip Interruption and Concierge Services * Roadside Assistance 21/31 City/Highway MPG Reviews: * Cabin does a good job of filtering out unwanted noise; rear seat offers more legroom than many competitors; loads of features for the money. Source: Edmunds Awards: * ALG Residual Value Awards * 2016 KBB.com 10 Best Luxury Cars Under $35,000 * 2016 KBB.com 5-Year Cost to Own Awards 2016 Kelley Blue Book Brand Image Awards are based on the Brand Watch(tm) study from Kelley Blue Book Market Intelligence. Award calculated among non-luxury shoppers. For more information, visit www.kbb.com. Kelley Blue Book is a registered trademark of Kelley Blue Book Co., Inc. KBB Fair Market Range Low: $23,693 KBB Fair Market Range High: $27,450 Celebrating 30 Years as Ohio's First Acura Dealer! 614-761-1222 Proudly Serving: Dublin, Columbus, Westerville, Chillicothe, Dayton, Xenia, Springfield, Wilmington, Beavercreek, Marysville, Cincinnati, Cleveland, Lancaster, West Jefferson, Grove City, and all of greater Ohio. 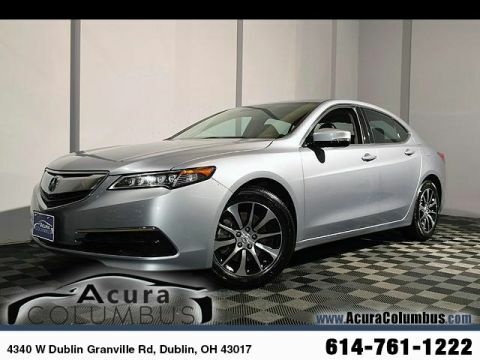 2016 Acura TLX 3.5L V6 SH-AWD w/Technology Package Silver 21/31 City/Highway MPG Certified. Acura Certified Pre-Owned Details: * Vehicle History * Roadside Assistance * Limited Warranty: 12 Month/12,000 Mile (whichever comes first) after new car warranty expires or from certified purchase date * Powertrain Limited Warranty: 84 Month/100,000 Mile (whichever comes first) from original in-service date * Transferable Warranty * 182 Point Inspection * Warranty Deductible: $0 * Includes Trip Interruption and Concierge Services Odometer is 3271 miles below market average! 21/31 City/Highway MPG Reviews: * Cabin does a good job of filtering out unwanted noise; rear seat offers more legroom than many competitors; loads of features for the money. Source: Edmunds Awards: * ALG Residual Value Awards * 2016 KBB.com 10 Best Luxury Cars Under $35,000 * 2016 KBB.com 5-Year Cost to Own Awards 2016 Kelley Blue Book Brand Image Awards are based on the Brand Watch(tm) study from Kelley Blue Book Market Intelligence. Award calculated among non-luxury shoppers. For more information, visit www.kbb.com. Kelley Blue Book is a registered trademark of Kelley Blue Book Co., Inc. KBB Fair Market Range Low: $22,183 KBB Fair Market Range High: $26,710 Celebrating 30 Years as Ohio's First Acura Dealer! 614-761-1222 Proudly Serving: Dublin, Columbus, Westerville, Chillicothe, Dayton, Xenia, Springfield, Wilmington, Beavercreek, Marysville, Cincinnati, Cleveland, Lancaster, West Jefferson, Grove City, and all of greater Ohio. 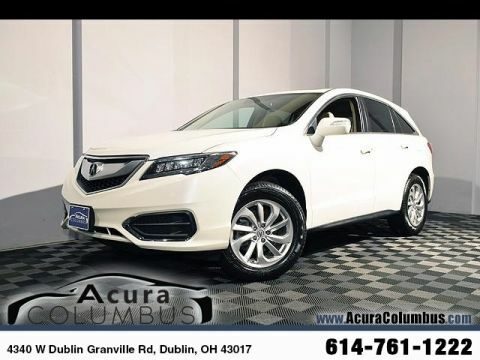 2016 Acura RDX AWD w/Technology Package White 19/28 City/Highway MPG AWD. 19/28 City/Highway MPG Reviews: * Strong acceleration and fuel economy from standard V6 engine; high-mounted rear seat provides generous legroom and a commanding view; more standard features than most competitors; price; generous cargo capacity for the segment. Source: Edmunds Awards: * 2016 KBB.com 10 Best Luxury Cars Under $35,000 * 2016 KBB.com 5-Year Cost to Own Awards 2016 Kelley Blue Book Brand Image Awards are based on the Brand Watch(tm) study from Kelley Blue Book Market Intelligence. Award calculated among non-luxury shoppers. For more information, visit www.kbb.com. Kelley Blue Book is a registered trademark of Kelley Blue Book Co., Inc. KBB Fair Market Range Low: $24,035 KBB Fair Market Range High: $26,642 Celebrating 30 Years as Ohio's First Acura Dealer! 614-761-1222 Proudly Serving: Dublin, Columbus, Westerville, Chillicothe, Dayton, Xenia, Springfield, Wilmington, Beavercreek, Marysville, Cincinnati, Cleveland, Lancaster, West Jefferson, Grove City, and all of greater Ohio. Purchasing a used car is a smart way to drive home a high-quality vehicle at an affordable price. 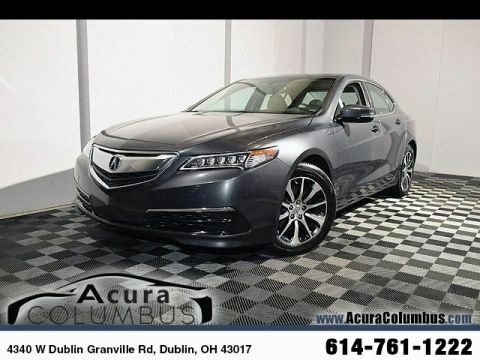 At Acura Columbus, we provide a great selection of pre-owned Acura cars and SUVs that can upgrade your daily drives for less. 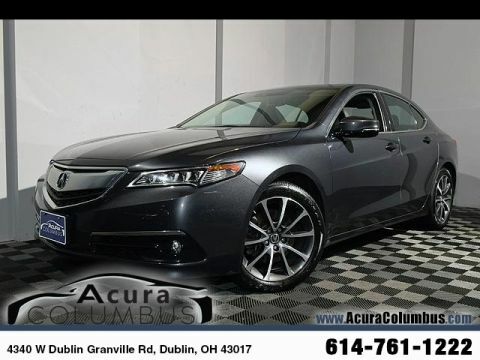 Our inventory of Certified Pre-Owned Acura TLX and MDX models make the most out of your commutes at an attractive price. Shop our used Acura SUVs like the Acura RDX to get the capabilities you need at the price you want. 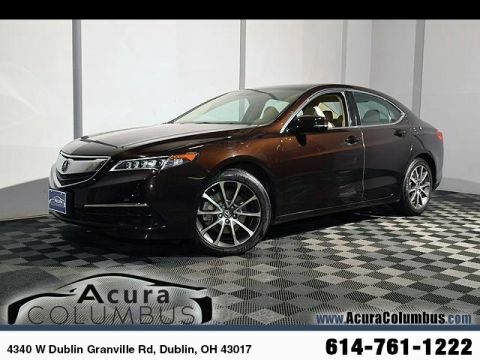 Our Dublin Acura dealership also sells a selection of used cars from a variety of other manufacturers, providing you with a wide array of vehicles to choose from. We are confident you’ll be able to find the ideal vehicle for your needs from our wide selection of pre-owned vehicles. We want to make sure that our customers trust us and the quality of our used vehicles, so we remain open and direct about our policies. When our customers come to us seeking honest advice about specific models, we never give misleading information just to make a sale. Instead, we point our customers in the direction that best suits their budget and their unique needs. We understand that investing in a used car isn’t an easy task. To help with the difficulty of financing a used vehicle, we offer used car specials to help lower the cost of driving our Dublin drivers’ preferred newer vehicle. When you make the decision to trust our Acura dealership in your used car search, you’re in good hands. Whether it be a question about financing or ordering a specific used model, our team is ready to help you figure out how to get the used car model you desire on the road. We want to help you bring this model off of our lot and into your driveway so that you can have the best driving experience possible. We’re sure that whatever model you choose, you’ll find yourself in a vehicle that is safe, and that performs well on the commute or even perhaps more spirited driving. 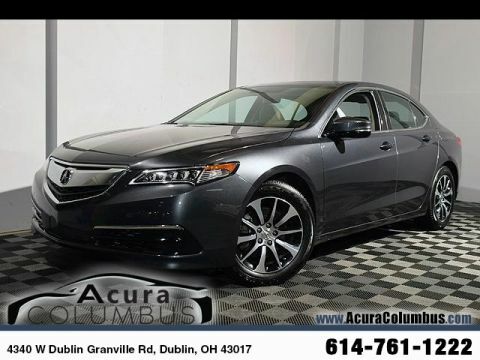 For more information on our used cars, visit us at Acura Columbus today!